Hovercrafts aren’t exactly the most popular form of transport even until today, but it does offer a slew of fun if you’ve ever hopped on one. Well, assuming you have never experienced such a privilege, then the RC Hoverpod could be just the thing for you, as it allows you to pilot your very own Hoverpod. Just like the real thing, the Hoverpod slides around the place by thrusting air downwards and propelling along in zippy fashion, leaving you to use the remote control to guide it past obstacles (tables, chairs, the legs of family members). Though it won’t work on water, you can still have hours of fun playing at being the skipper as you nimbly guide the Hoverpod across smooth floors and carpets (as long as the pile isn’t too shaggy). The law of diminishing returns applies here, where a 10-minute charge offers 5 minutes of hover-time, while the remote control ought to be stocked with a quartet of AA batteries. As with everything else, there is a need for practise as the RC Hoverpod has a learning curve before you can zip it around with aplomb. 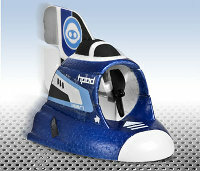 Each of the RC Hoverpods will cost £24.99, where you can choose from red or blue colors.